Newtown’s strongly-built centre Jordan Drew makes a break against the Illawarra Cutters at WIN Stadium last Saturday, with Jets winger Travis Robinson in close support. Photo: Mario Facchini Photography. 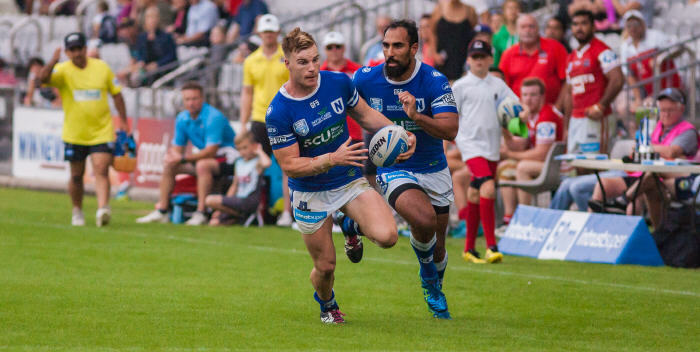 Report on the Intrust Super Premiership NSW 7th round match between the Illawarra Cutters and the Newtown Jets, played at WIN Stadium, Wollongong on Saturday, 16th April 2016 by Glen ‘Bumper’ Dwyer. The Illawarra Cutters pulled back a 14-6 deficit against the Newtown Jets on Saturday, and then went on to win this seventh round Intrust Super Premiership (ISP) match by 28-14. The Jets had the better of most of the first half and probably should have led by more than 14-10 at half-time. Newtown made a slow start at WIN Stadium, Wollongong and the Cutters scored a converted try in the sixth minute. The Jets started to get a better share of possession and turned in a strong second quarter. Newtown looked to have taken control through two tries to halfback Fa’amanu Brown and one to winger Travis Robinson, with Brown converting one try from the sideline. The fortunes of Rugby League can indeed be fickle and a series of game-changing incidents occurred just before and after the half-time break. The Jets went close to scoring their fourth try in the 38th minute when winger Josh Gagan appeared to have safely grounded a chip kick by five-eighth Josh Cleeland into the right hand southern corner. Newtown had previously declined to take a shot at penalty goal and had instead gone for the tap-kick option. In the last minute before the break the Cutters carried the ball one hundred metres upfield and scored an unconverted try virtually on the siren. The second half began badly for the Jets with the Cutters scoring in the third minute, retaking the lead by 16-14. While there were plenty of opportunities for Newtown to wrest back the lead, the Jets’ second half was marred by repeated instances of dropped ball, lack of discipline and untidy play. Meanwhile the Cutters added two more tries and a late penalty goal to ensure their home ground victory. Fa’amanu Brown was the Jets’ best player on the day in what was a disappointing second half performance from the Newtown team. There were mixed showings from several Jets players who had good first halves and somewhat indifferent second sessions. Newtown has a bye next weekend (23rd and 24th April), which is the eighth round of the ISP NSW competition. The Jets next game will be on Saturday, 30th April when they meet Wentworthville at Cessnock Sports Ground at 4.45pm. This ISP ninth round has been designated by the NSW Rugby League as the Country Roads promotional weekend, with most of the ISP matches being taken to NSW regional venues.